My parish has an obscure saint as its patron – Saint William of Montevirgine (or Vercelli). 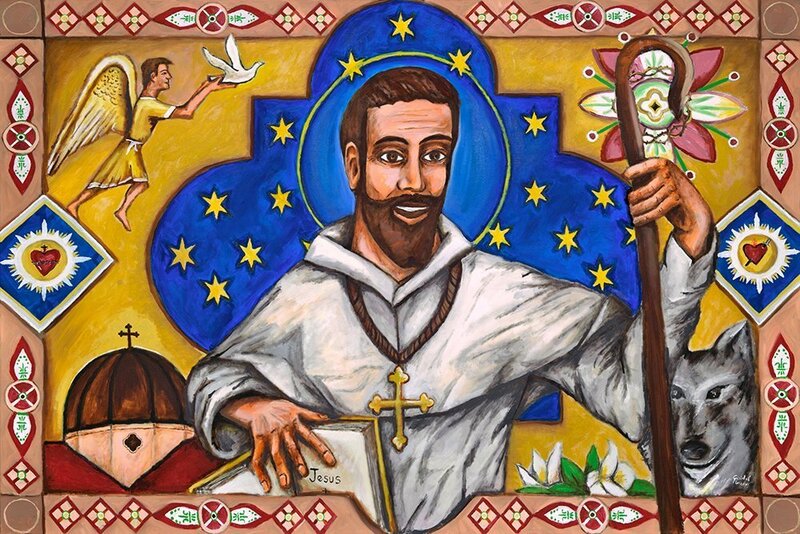 He is often confused for other saints like St. Francis because of some of their common symbols and simple garments. He is also distinctly depicted across global regions. This is common with older saints that lived in a time where we have little knowledge of the details of their lives. Artists often depict these saints with symbols that communicate best to the target audience instead of worrying about authenticity. Reading the history of St William parish, I found that one of the main reasons he was chosen was to honor Archbishop William O’Brien, head of the Catholic Church Extension Society in 1939. He approved the land purchase and helped pay to build a parish church for the Mexican community of Round Rock and McNiel. In the many years since its founding, the parish has become incredibly diverse and is made of parishioners from all over the world. Still, there is a very large presence of Latinos from al throughout Latin America. I chose to use my Latino-flavored style of art to honor the culture of a parish originally established for Spanish speakers. I also tried to balance this look with a saint native of Italy. Each of the elements holds a meaning about the message of the saint and the mission of our parish. St. William became an abbot and founder of a religious community on Monte Virgine. In the painting, he uses the traditional symbols of a pectoral cross and crozier that are traditionally used by bishops and abbots. He was alive so long ago that there is little known about the details of the color of his habit or look of his face. In the United States, he is often depicted in brown, in Latin America is often wearing black, but he is commonly shown wearing white in Italy. This is most notable in the images of the church at Montevirgine. The border is inspired by the pattern seen on the white dividers of the ceiling inside of the main church. The saint is also framed within a Spanish rose cross that is used in the logo and throughout the parish architecture. The background of the cross is a setting of golden stars on a blue background as seen on the ceiling of the main church building and an ancient symbol of a sacred space. The colors of the painting are also vibrant selections of colors used in the parish marketing and buildings around the campus. The Principality of the parish, or the angel assigned to protect the community, is shown releasing the Holy Spirit as a dove from the logo over the parish. The bottom left shows the cupola (dome), the most notable architectural mark of the parish that can be seen from the nearby interstate highway. The Roman style cross that the saint is wearing is also the same one seen in the logo and at the top of the dome. The pierced heart in the middle left side displays the devotion of the parish to the Sacred Heart of Jesus that has been an important element of the spirituality of the community since the beginning. The chapel on the campus is dedicated in honor the Sacred Heart of Jesus, and it was the first choice for naming the parish before selecting St. William. The top right side shows a floral symbol known as a passion flower behind his crozier. This is one of his common symbols and represents the saint’s connection with the passion of Jesus. Under his left arm is a bouquet of lilies that is a common symbol of saints known for the heroic virtue of purity. In the bottom left of the painting, a wolf is held back by St. William’s crozier, symbolic of the patron’s spiritual protection through intercession. It is also a classic symbol of the saint because of the legend that he tamed a wolf after it killed his donkey. This is one of the common symbols that St. William shares with St. Francis of Assisi, but he tamed and rode the wolf instead of just befriending it like Brother Francis. The middle right depicts a heart pierced by a sword representing the Immaculate Heart of Mary. St William had a deep devotion to Holy Mother Mary and establish his monastery upon the mountain named in honor of the Blessed Virgin Mary. The open Bible in St. William’s right hand shows the most important mission of the saint and the parish, to point the world to the Truth of Jesus Christ as our Lord. He smiles and keeps it open to point to the name of Jesus while holding it close. I created this painting as a gift for the parish’s new Evangelization Center, but details of when and where it will go up are still pending.